The bathymetry data provided represent a continuous surface from interpolated transect measurements of depth values of Lago Curuai, an Amazon River floodplain lake, upstream from Santarem, Para, Brazil. Field measurements were made in June of 2004. The first product contains the actual depth values (in meters) of the interpolated continuous surface in both ENVI and GeoTIFF formats. Also available is a color scaled depth GeoTIFF image which has an embedded color scale bar. This secondary file is meant only for viewing but has the unique advantage of being a GeoTIFF file. Therefore, this map can be a background image with other projected files of interest in the area. 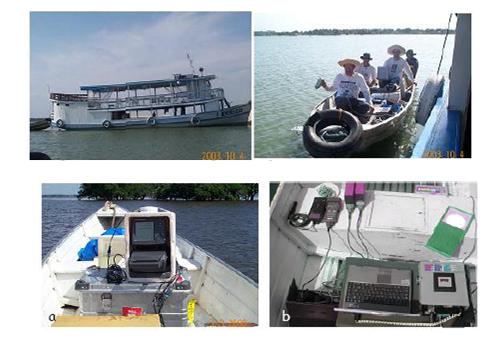 Data provided in this data set were used to develop a methodology for processing and applying high resolution bathymetric linear transect field data acquired with a Lowrance-480M ecosounder in the Amazon floodplain. This research was supported by the addition of Landast/TM images for planning and executing the survey. 4600 km of transects were processed semi-automatically and integrated into a georeferenced database. A digital elevation model with 15 m horizontal resolution and 1 cm vertical resolution was generated for the floodplain. The changes in inundated area and volume of water on the floodplain were estimated. Regression models were constructed to predict flood area and water stored volume from water level. The results of this research show that water level and flooded area mapped from images are good enough for estimating water stored volume in the Lago Grande de Curuai (Barbosa et al., 2006). Figure 1. Continuous surface of interpolated transect measurements of depth values of Lago Curuai, an Amazon River floodplain lake, upstream from Santarem, Para, Brazil. This data set was archived in March of 2011. Users who download the data between March 2011 and February2016 must comply with the LBA Data and Publication Policy. The bathymetry data provided represent a continuous surface of interpolated transect measurements of depth values of Lago Curuai, an Amazon River floodplain lake, upstream from Santarem, Para, Brazil. The first product contains the actual depth values (in meters) of the interpolated continuous surface saved as binary values in both ENVI and GeoTIFF formats. Also available is a color scaled depth GeoTIFF image which has an embedded color scale bar. This secondary file is meant only for viewing but has the unique advantage of being a GeoTIFF file. Therefore, this map can be a background image with other projected files of interest in the area. The bathymetry data product is a binary data file representing a continuous surface of interpolated point measurements of depth values of Lago Curuai. The bathymetric map is provided as 4-byte float, plain binary raster image, 6527 columns by 2857 rows, 1 band, with 15 m pixel resolution. The data are provided in both an ENVI and a GeoTIFF file format. Also available is a color scaled depth GeoTIFF image which has an embedded color scale bar. The secondary file is meant only for viewing but has the unique advantage of being a GeoTIFF file. Therefore, this map can be a background image with other projected files of interest in the area. These files contain the actual depth values (in meters) of the interpolated continuous surface and are saved as real numbers. Zero depth refers to a water surface of 936 cm at the water gauge. The gauge Hidroweb number is 17060000. The background is masked and has its pixels set to a value of 13 m. The deepest point of the lake is less than 13 m deep. The files are in two formats, an ENVI file format called Barbosa_Curuai_masked_bathymetry.img and it’s associated header file, Barbosa_Curuai_masked_bathymetry.hdr. The .hdr file is a plain text header file formatted for ENVI software. It contains the necessary parameters to open the ENVI file. The second file is a GeoTIFF file format and is called, Barbosa_Curuai_masked_bathymetry.tif. This file has the same pixel values, map, and projection information as the ENVI file. A color-key legend is embedded in the upper left, with a block of pixels graded in value from 0 to 13 so that whatever color scale is applied, it will automatically create a legend image in that box. The no-data-value pixels surrounding the lake are set to 13.0 as a mask value. This GeoTIFF, Barbosa_Curuai_bathymetry_colorscale_mapgrid.tif, is a 3-band file with pixels scaled to 1-byte (0 - 255) and is for display only. This image (or regular grid) is georeferenced and can be used as a background image with other georeferenced images for this area. The northwest corner is at 55 deg 56 min 10.39 sec west and 1 deg 55 min 39.74 sec south. The projection is UTM zone 21 south, SAD-69/Brazil. Figure 2. Color scaled depth GeoTIFF image. This image is georeferenced and can be used as a background image with other georeferenced images for this area. This bathymetry map was used to plan measurement sites and to study flow between the lake and surrounding floodplain. The results of this research show that water level and flooded area mapped from images are accurate enough for estimating the water stored volume in the Lago Grande de Curuai. This data set could be used in the future to estimate the volume and the flooded area for different values of water level at the floodplain. The digital elevation model of the bottom of Curuai floodplain has a horizontal resolution of 15 meters and vertical resolution of 1 centimeter. The error in horizontal position is +-15 meters and the depths have +- 1 centimeter of error. High resolution bathymetric data was acquired with a sonar device, the Lowrance-480M ecosounder, deployed from a boat on a series of tracks across Lago Curuai. in the Amazon River floodplain upstream from Santarem, Para, Brazil, in June of 2004 (Barbosa, 2005). This data was supported by Landast/TM images for planning and executing the survey. Transects totaling 4600 km were processed semi-automatically and integrated into a georeferenced database. 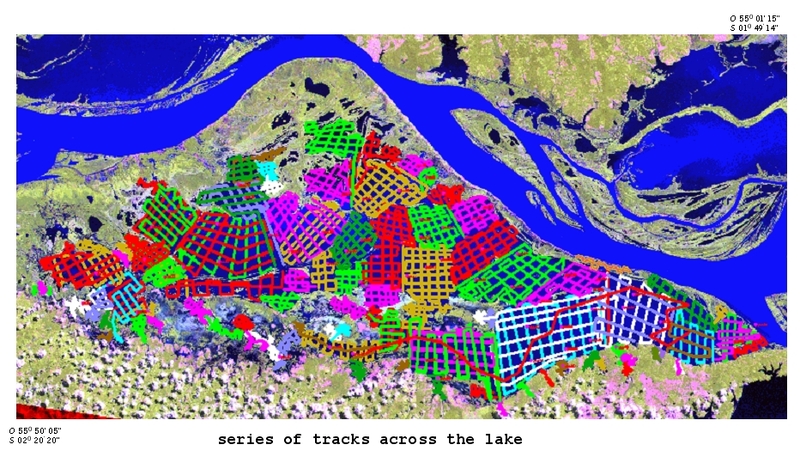 A digital elevation model with 15 m horizontal resolution and 1 cm vertical resolution was generated for the floodplain. The changes in inundated area and volume of water on the floodplain were estimated. Regression models were constructed to predict flood area and water stored volume from water level. The resulting irregular grid of depth points was used to create a surface map using kriging methods. Figure 3. High resolution bathymetric data was acquired with a sonar device, the Lowrance-480M ecosounder, deployed from a boat over 4600 km of transects. Lima, I.B.T., C.C. Barbosa, E.M. Novo, J.C. Carvalho, and J.L. Stech. 2005. Location of telemetric monitoring sites in Amazon floodplain Lakes, Acta Amazonica: 36(3), Manaus. Barbosa, C.C.F., E.M.L.M. Novo, J.M. Melack, R.M. Freitas, and W.P. Filho. 2006. A methodology for analysis of volume and flooded area dynamics: Lago Grande de Curuai Lago as an example. Revista Brasileira de Cartografia 58/3.